Flooding from a burst water main in a tunnel has left the Thameslink rail operator 'unable to run any trains' in London until the problem is fixed. About 50,000 litres of water poured into the tunnel between St Pancras and Farringdon on Friday. 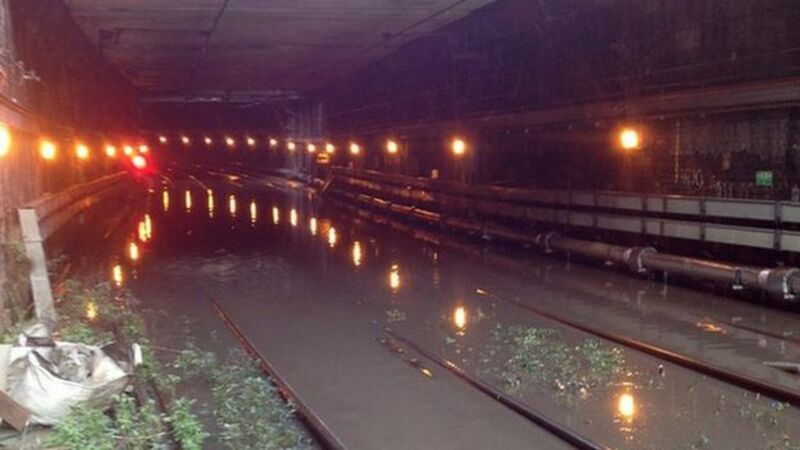 Network Rail said it was still pumping water out, and expected disruption to continue for the rest of Monday. Train operator Govia said the issue was causing 'major delays' on services from Bedfordshire and Hertfordshire. The Thameslink line, which runs from Bedford to Brighton, also serves commuter stations in south London and Kent. Flooding from a burst water main in a tunnel leaves a rail operator "unable to run any trains" in London until the problem is fixed. A Metropolitan Line train for Aldgate East arriving at Farringdon station platform 4 in the summer of 2005 as a southbound Thameslink service leaves platform 2 with a Bedford - Sutton working on the widened lines. Note that this photograph features at least two individuals who do not appear to be using mobile phones. City Thameslink in landscape format [see image 35100]. No shortage of steel in these parts. View over Borough Market Junction on 20 July with trains on the Charing Cross / Blackfriars route (left) and the cross-Thames lines from Cannon Street. The new east-west viaduct seen under construction will enable quadrupling here, with the southern pair of lines handling trains to and from Charing Cross and the northern pair providing Thameslink trains with a dedicated route to Blackfriars - essential in providing the planned 24tph peak service on the route. London Bridge station is just off picture bottom right.